What are some of the latest statistics related to cancer in the fire service? Cancer is the most dangerous threat to firefighter health and safety today. Cancer caused 61 percent of the career firefighter line-of-duty deaths from January 1, 2002, to March 31, 2017, according to data from the International Association of Fire Fighters (IAFF). Heart disease caused 18 percent of career LODDs for the same period. Cancer caused 70 percent of the line-of-duty deaths for career firefighters in 2016. The cancers mostly responsible for this higher risk were respiratory (lung, mesothelioma), GI (oral cavity, esophageal, large intestine), and kidney. Are firefighters’ risks for certain types of cancer significantly higher? Firefighters’ risks are significantly higher for some specific types of cancer than the general population. In 2013, NIOSH researchers reported a two-fold excess of malignant mesothelioma, a very rare cancer. Put another way, firefighters have a 100 percent increased risk (100 percent = double = 2 times) of getting mesothelioma. Firefighters have a 129 percent increased risk of dying from mesothelioma. A 2006 meta-analysis by Grace LeMasters of 32 firefighter cancer studies noted a two-fold excess for testicular cancer. Firefighters have a 62 percent higher risk of getting esophageal cancer, and they have a 39 percent increased risk of dying from esophageal cancer, according to the NIOSH research. leukemia - 1.14 times greater risk. What about cancer statistics for volunteer firefighters? There’s little data about cancer among volunteer firefighters, but firefighting increases cancer risks significantly for all firefighters. The Firemen's Association of the State of New York (FASNY) and Northwell Health launched a research project in 2017 to examine cancer incidence and mortality among NY volunteers. We will be sharing details about that research as they develop. What about cancer statistics for women and non-white firefighters? There have been relatively few studies about cancer among women and non-white firefighters, in part due to their statistically smaller representation in the fire service. There’s a small but growing number of studies with women firefighters and the specific cancer risks they face. We will be sharing details about that research as it develops. Black men have the highest risk of prostate cancer overall, according to CDC data from 2013, the most recent year for which data has been reported. The International Association of Black Professional Firefighters provides periodic prostate cancer prevention tips to its members via an email newsletter. 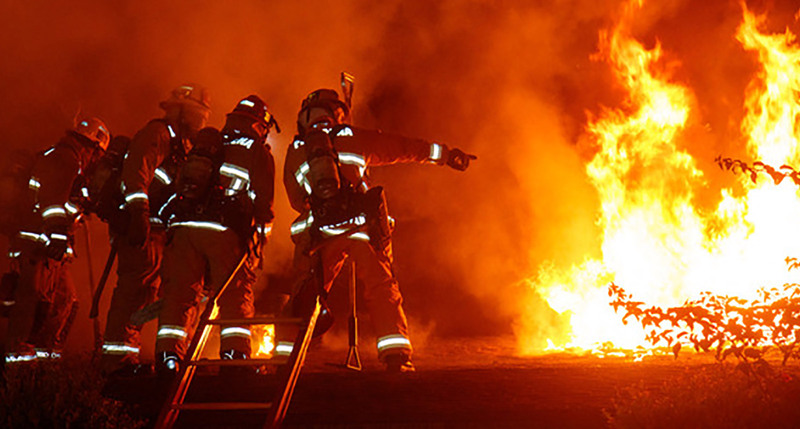 What research supports the link between firefighting and cancer? Research spanning decades, continents, and more than 80,000 firefighters validates the connection between firefighting and occupational cancer. Here is an overview of key studies. The 2017 Blais University of Ottawa study examined chemical exposure occurring during emergency, on-shift fire suppression. The researchers found firefighters absorb harmful chemicals, including polycyclic aromatic hydrocarbons (PAHs), through their skin. Firefighters had from three to more than five times the amount of by-products of PAHs in their urine after a fire compared to before the fire. The 2013 Daniels NIOSH study (phase 1) is the largest study of U.S. firefighters to date. It examined mortality patterns and cancer incidence for 30,000 firefighters. The NIOSH study, which began in 2010, found statistically significant mortality and incidence rates of all cancers and cancers of the esophagus, intestine, lung, kidney, and oral cavity, as well as increased mesothelioma for firefighters compared with the general population. The NIOSH study found excess risk of bladder and prostate cancers at younger ages. The NIOSH study also is significant because it spanned geographical distance (San Francisco, Chicago, Philadelphia) and decades (1950-2009). It is one of the few studies to date that has included women and non-white firefighters. The 2015 Daniels NIOSH study (phase 2) examined firefighters’ work histories and variables such as fire runs, use of personal protective equipment (PPE), and use of diesel exhaust control systems. It compared the cancer risk for firefighters with higher exposures to carcinogens with those who had lower exposures. In this phase, researchers found that lung cancer and leukemia risk increased with exposure. The 2014 Pukkala Nordic study of 16,422 firefighters from five Nordic countries found an increased risk for all cancers combined among firefighters, similar to the NIOSH phase 1 study. It found significant increases in melanoma and non-melanoma skin cancer; lung cancer; and prostate cancer from 1961 to 2005. The 2008 Kang Massachusetts study compared cancer incidence among Massachusetts firefighters with that of Massachusetts police officers and other occupations. When compared with police officers,firefighters were found to have increased cancer risks. This study found the firefighters had a 90 percent higher risk for brain cancer and an 81 percent higher risk for Hodgkin’s lymphoma. Researchers examined data from 1987-2003. The 2006 LeMasters meta-analysis reviewed data from 32 studies of firefighters for 20 different types of cancer. Risks for 10 types of cancer were “significantly increased” in firefighters. Risks for the other 10 types were increased, although not to the same extent. The 2006 Fangchao Ma Florida study compared Florida firefighters’ cancer incidence rates (rather than mortality) with those of the general Florida population. It was the first such study to include women. Florida researchers examined data for 34,796 male and 2,017 female firefighters and found 1,032 total cases of cancer (970 male & 52 female). The top cancers for male firefighters were prostate (13.7 percent), skin (8.4 percent), colon (7.1 percent), bladder (6.9 percent), and testicular (5.5 percent). The most prominent cancers for female firefighters in Florida were breast (27.8 percent) skin (7.6 percent), thyroid (5.6 percent) and lung (4.6 percent). Are erroneous firefighter cancer statistics a concern? Note that some fire departments are addressing occupational-cancer rates that are higher than national averages. For example, FCSN instructors cite insurer statistics for Miami-Dade Fire Rescue: 32 percent (nearly one-third) of MDFR’s active members were diagnosed with cancer or receiving cancer treatment between 2008-2010.